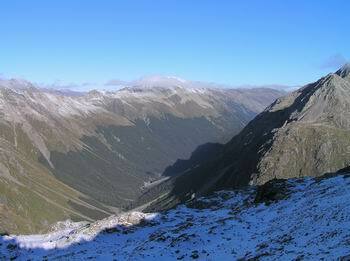 There's been a lot said and written about the formidable Waiau Pass. 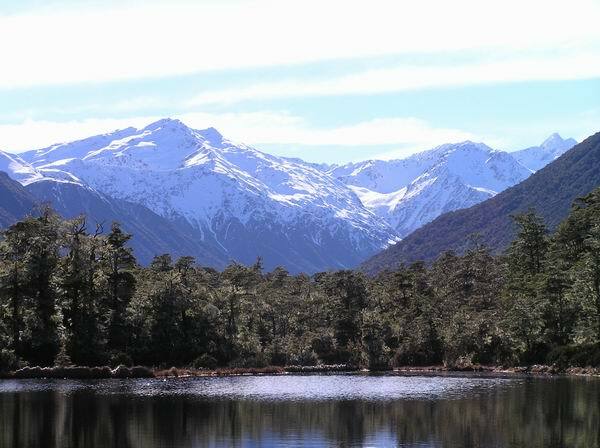 But I would say it's one of the best and most scenic routes used in the Nelson Lakes National Park. 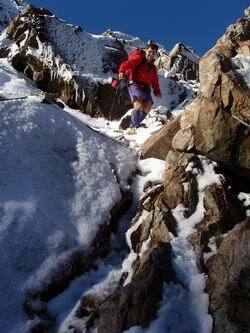 Treated with respect and suitable weather it's achievable to the average reasonable fit tramper. Many parties have also been forced to turn back because of bad weather. There's no disgrace in having to turn back. In fact I tend to respect people who have the courage to call it a day. The Pass is always going to be there for you to have another go in the future. I myself had to turn back because of bad weather on three different trips before I managed to get over the Pass. The best time to attempt this crossing is from December through to May. The weather tends to be unsettled December and early January. Sometimes there can still be snow on the Pass into mid January. The best settled weather patterns are normally late February to early May. 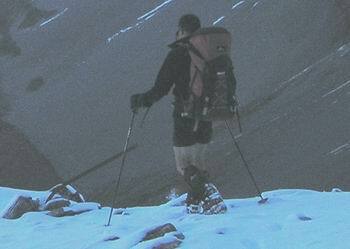 Winter crossing should only be attempted by those who have crampons & ice axes and the skills to use them. 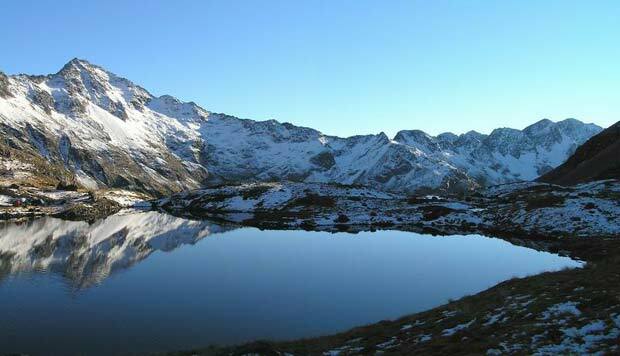 There are a number of avalanche paths to be crossed just below Blue Lake Hut and sidling around Lake Constance. 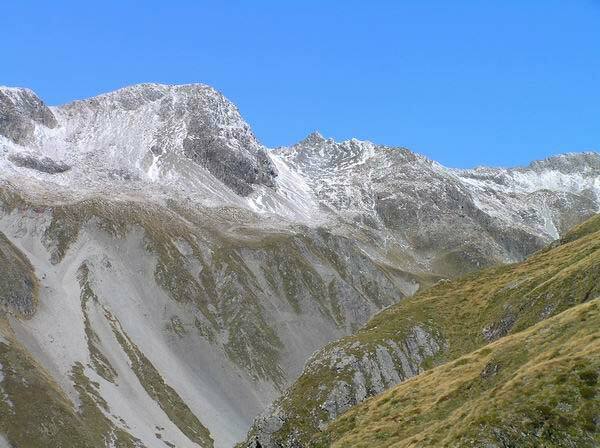 The descent off the Pass into the Waiau Valley is particularly prone to severe avalanching. 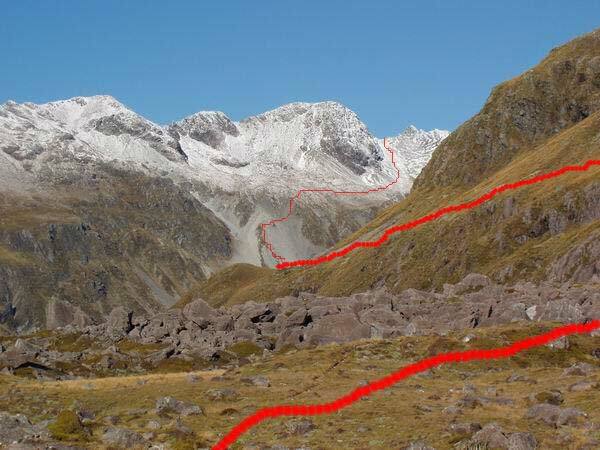 Most of the poles on this side of the pass are bent over or snapped off from avalanches(check out the photos above). 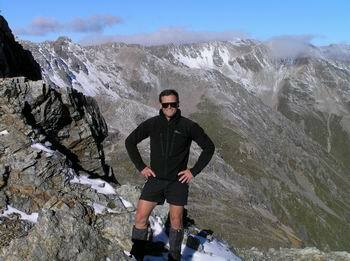 Best to check with DOC St Arnaud for the avalanche risk before setting off. The most important thing of all is to have good snow craft skills and the knowledge on how to read the snow conditions. 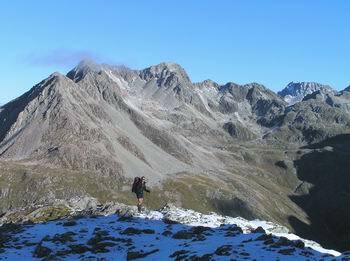 At the end of this trip report you will find photos with routes marked on them. 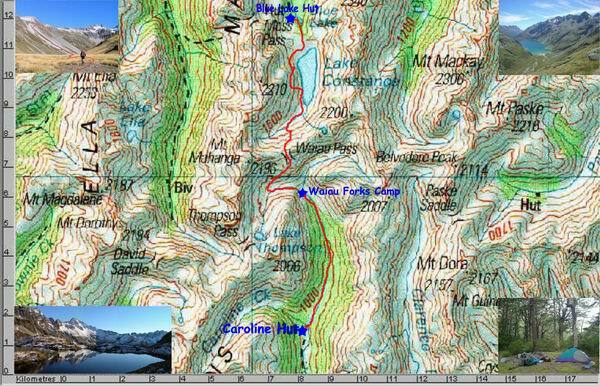 Plus a map showing The Route, Blue Lake Hut, Caroline Bivy and The Waiau Forks Camp Site. 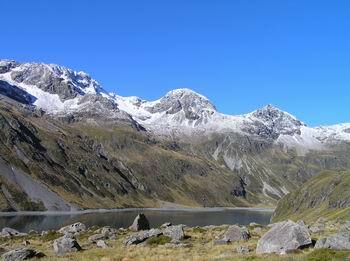 Also you will find a list of alternative routes from The Waiau Pass. 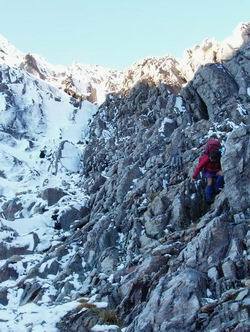 Most guide books mention that it takes about 8 -12 hours to tramp from Blue Lake Hut to Caroline Bivy. Yeah Right !!!. For us mere mortals I would allow at least 12 -15 hours. 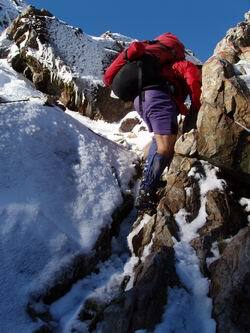 If you have problems traversing steep rocky terrain then expect to take longer. 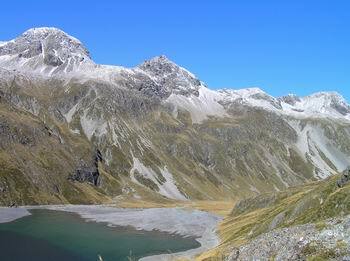 It's easier to either camp at the bottom of the Waiau Pass at the head of Lake Constance (watch out for the Canadian Geese Poo) or aim to camp at the beautiful Waiau Forks Camp Site(see map). Rather than making it a very long day getting to Caroline Bivy. Which is a lovely little Bivy but only sleeps 2 or 4 people. 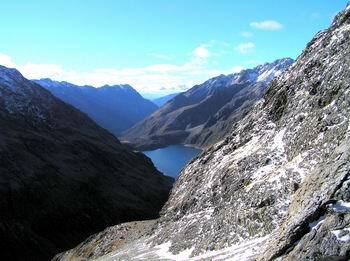 It's pretty straight forward on a marked track from Blue Lake Hut to the Lake Constance Dam. The route around Lake Constance is poled but they are well spaced apart. Forget about trying to get around either side of the lake. Unfortunately you will be bluffed out either way and of course lose time back tracking. Once on top of the dam climb up the slope on the western side of Lake Constance. Get well above the bluffs before sidling around the Lake. Each time I've tried to find a easier way by going too low. I've ended up struggling through the small bluffs and still end up climbing higher. About two thirds of the way sidling above the bluffs you come to a bench (see photo). 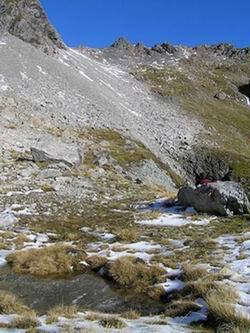 Then the route descends steeply down a scree slope following a creek to the shore of the lake. Then it's a easy slog around the shore dodging the Canadian Geese poo and up the valley to the obvious sign saying Waiau Pass. 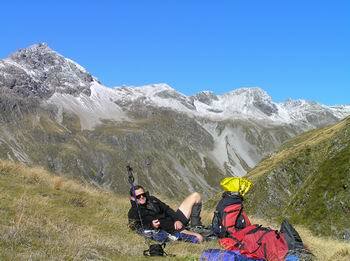 It's probably a good time to have a cuppa and rest before slogging up the steep scree slope. 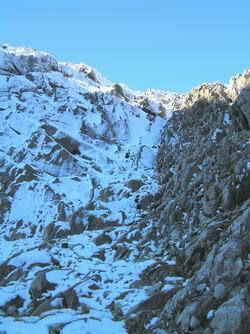 Again the route is poled right to the top. This Is What It's All About !!!! At first the ascent looks a bit daunting. But it's not too bad if you stop often and turn around to take in the views. (remember nobody is timing you). (Every time I do this section my heart feels if it's going to burst through my chest cavity). 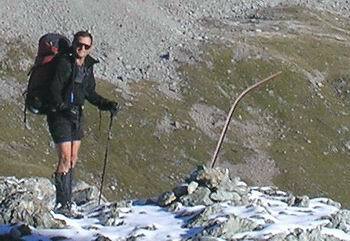 Follow the poles up the strip of vegetation until you almost reach the top of the scree slope. Then sidle across to your right over the scree to a obvious high bench. This high bench is a welcome piece of flat terrain. 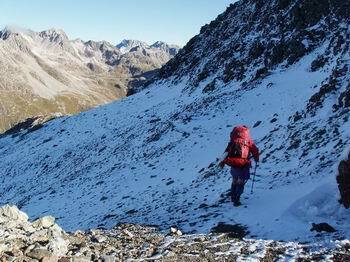 But unfortunately short lived before once again you are climbing another scree slope to the top of the Pass. Once you have recovered your breathing and the black spots have stopped passing before your vision it suddenly all becomes worthwhile. The views are just stunning !!!!! Richard Enjoying The Views From Waiau Pass Or Is He Laughing At Me Because I'm Still Trying To Get My Breath Back ? 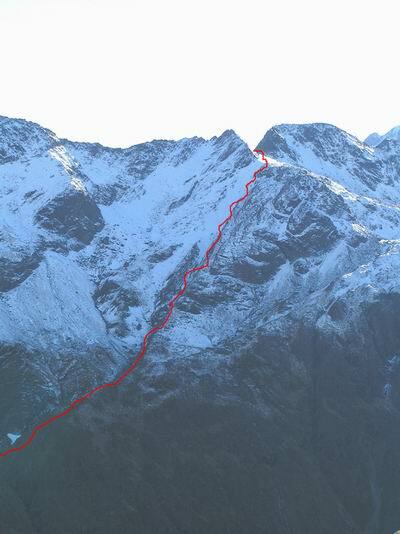 The route is sparsely poled right down to the Waiau Valley floor. 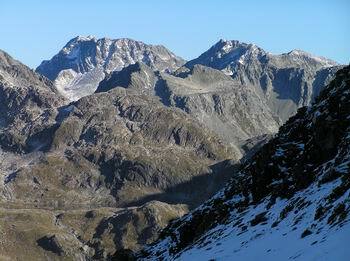 From the pass sidle to your right across a scree slope until you come to a flattish Spur (forced to camp here once in waist deep snow. But that's another story). The route drops off this spur to your right and down a series of steep rocky steps (not to difficult). After this section your knees and feet will start yelling "are we there yet !!!!!!" 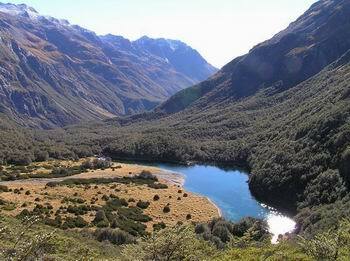 About three quarters of the way down you will notice a stream on your left and what looks like the Waiau Valley floor. Don't be tempted to drop into this stream as it ends in one final large waterfall into the Waiau Valley. 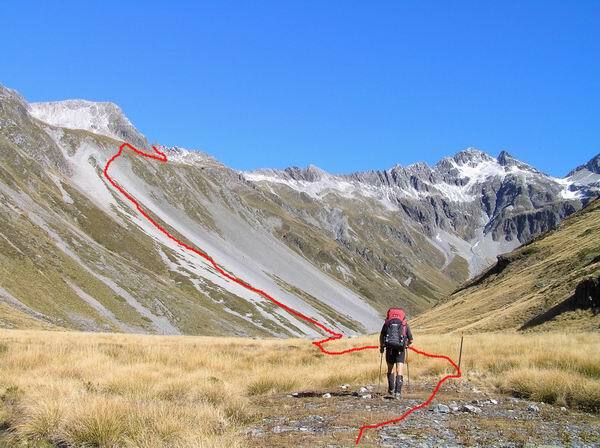 So just keep on the spur until you reach the Waiau Valley floor at the junction of Thompson River & Waiau Rivers. If you have the time or energy. Try for a side trip to Lake Thompson. Better still if you have an extra day it's worth while to camp the night at the lake just to get those perfect reflections. 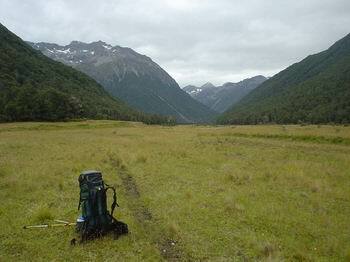 From the Waiau & Thompson River Forks to Lake Thompson takes about 1hour without a pack or 2 hours with a pack. 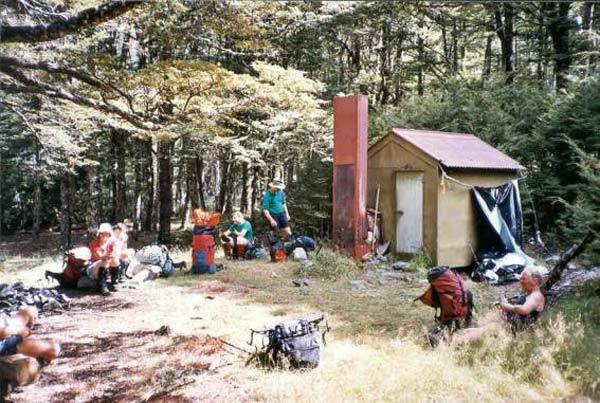 From the Waiau & Thompson Forks it's a matter of dodging rocks and bush bashing down the true left of the Waiau River to the Waiau Forks camp site. 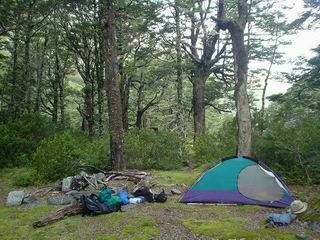 From the Waiau Forks cross over to the true right and it's about 1-2 hours stroll through beech forest to the lovely Caroline Bivy. From the Caroline Bivy it's a torturous 7-9 hour slog through Bovine Alley to the Christopher Hut on the St James Walkway. 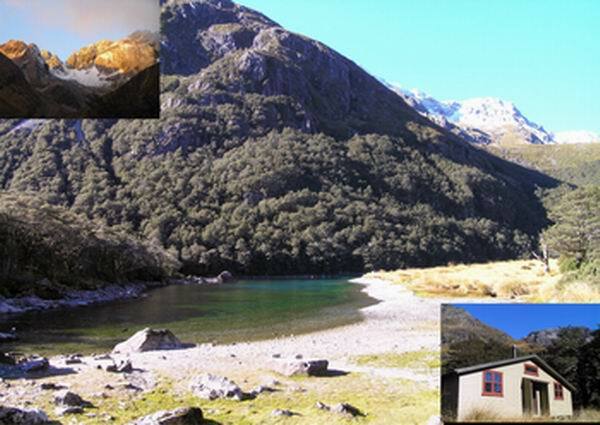 If you want a break from dodging cow pats and matagouri I would suggest breaking the trip by staying a night at Lake Guyon Hut. Which is not difficult to get to from the valley floor. A word of warning stay away from the Ada Homestead. Leave all gates as you find them and please don't drive the cattle down the valley in front of you. Do this and you wont have any problems with the owners. They are very private people. So please respect their privacy.